Bladen County’s Shy’Asia Ratliff receives her home run ball Saturday after hitting a grand-slam home run in Bladen’s 17-8 win over Leland in the North Carolina Dixie Youth Baseball Small League State Tournament. Making the presentation to Shy’Asia is North Carolina State Director Carey Wrenn and District 9 Director Carl Newkirk. 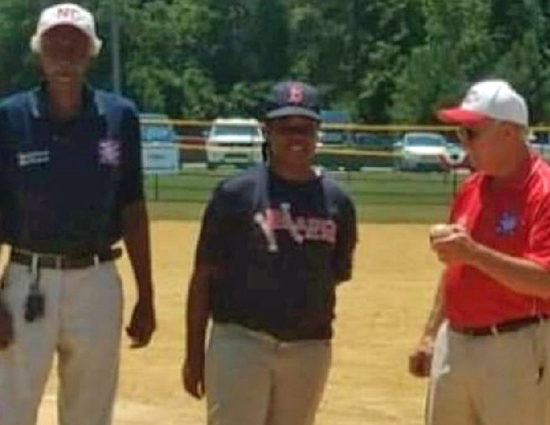 KENANSVILLE –Shy’Asia Ratliff walloped a grand-slam home run Saturday to lead Bladen County to an 18-8 victory over Leland in the opening round of the North Carolina Dixie Youth Baseball Small League State Tournament. Andre Moore belted a first inning single and raced home when Ratliff’s grounder was misplayed by the shortstop. The Bladen lead grew to 3-0 in the second inning. Mason Brooks and Trent Meares cracked 2-out singles with Meares driving in Brooks. Aaron Wren knocked in Meares with a single. The 11-run third inning explosion opened up a 14-0 Bladen lead. Dee Davis, Hezzy Blanks and Moore smacked singles to begin the rally with Davis darting home on Moore’s hit. Ratliff slammed a double that scored Blanks and Moore. Matt Kemp was hit by a pitch, and D. A. Smith delivered a single that scored Ratliff. Brooks swatted a single that scored Kemp. Walks to Meares, Blanks and Moore drew walks that forced home Smith and Brooks. Kemp then blasted the home run that scored Meares, Blanks and Moore. Leland rallied with 4 runs in the home third and 3 more in the fourth to close the gap to 14-7. Bladen tacked on a run in the fifth. Meares reached base and sprinted home when Moore hammered a triple for a 15-7 lead. Leland scored once in the fifth, but Bladen County tallied 2 more runs in the sixth. Brooks and Smith laced one-out singles, and Joe Johnson followed with a single that was misplayed by the leftfielder allowing Brooks and Smith to score. Ratliff batted 2-3 with a home run, a double, 2 runs scored and 6 runs batted in to lead the Bladen team. Moore turned in a perfect 3-3 game at the plate with a triple, 3 runs scored and 3 rbi’s. Smith batted 2-4 with an rbi and 2 runs scored. Brooks was also 2-4 at the plate with an rbi and 2 runs scored. Blanks, Kemp, Meares, Wren and Davis connected for one hit each. Meares scored 3 runs, Kemp and Blanks scored 2 runs each, and Davis scored a run. Blanks, Meares, Wren and Johnson drove in one run each. Bladen County will play the winner of Saturday’s game between North Duplin and Coats at 4:30 Sunday afternoon.